Welcome to Garden Bloggers’ Bloom Day for April 2010. If someone had told me that I would have dwarf bearded iris in bloom in mid-April, I would have had to check my zip code to see if my house and garden had moved south on me. 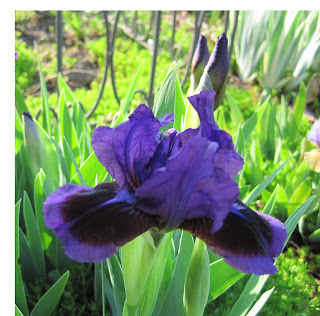 But the proof is in the picture showing Iris pumila ‘What Again’ now blooming in my garden. Near it is Iris pumila ‘Smart’. What is going on around here? Spring seems so fast and frantic and in such a hurry this year! It seems that all of the blooms are a week to ten days earlier than in 2007. And earlier than in 2008. And earlier than in 2009. Many blooms that were blooming on this day in the past three years have already faded away, including Forsythia, Amelanchier, and Magnolia. You will see none of those pictured today. In their place it seems we have everything else blooming at once, including apple trees and crabapple trees like this one in my front garden bed, Malus ‘Guinivere’. 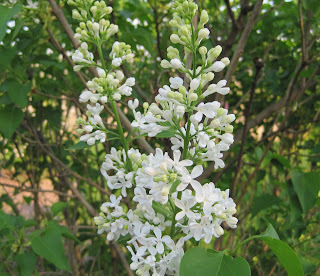 The common and very fragrant lilacs, Syringa vulgaris, are in full bloom, too, including this one called ‘White Angel’. Nearby is a Korean Spice Viburnum, Viburnum carlesii, which is also very fragrant. The lilac and viburnum are competing to get my attention all at the same time. Everywhere I look there are blooms on plants that I’m just not ready to have blooming! I need more time this spring. I have decisions to make on moving and removing plants for the new garden design. 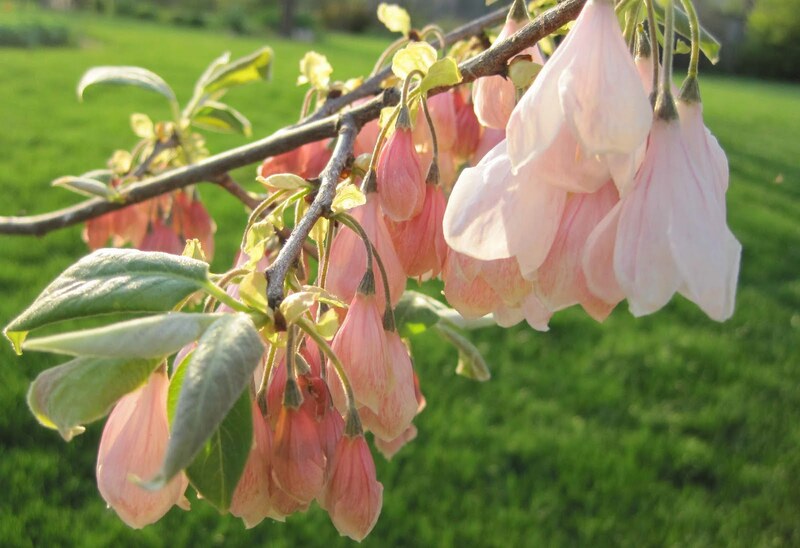 Should I remove the Carolina Silverbell, Halesia carolina ‘Arnold Pink’? Its blooms are interesting and unique and early this year – did I mention how early everything is blooming this year - and I've wanted one of these trees for the longest time, but half the tree is dead. I don't think I'm ready to let go of it quite yet, though, so I’ll trim out all the dead wood and see what’s left. Even the weeds are ahead of themselves, including this dandelion, Taraxacum officinale, which has taken advantage of a microclimate near the house to bloom and set seed. With all this early bloom in April, I can hardly see straight when I go outside, trying to decide what to do, what to move, what to leave alone, what weeds to pull, wondering if the heat will affect the sweet peas and garden peas and other cool season crops like lettuce and spinach. Though they are mere seedlings at this point, I wouldn't be a bit surprised if the spinach and lettuce was ready to bolt and flower with these warm, sometimes record setting hot, days of April. All of this early bloom makes me feel frantic, like I’m Rip Van Gardener who fell asleep in early spring and woke up to find out it was summer. It makes me feel like I'm behind, like Lucy and Ethel working in the candy factory, frantically trying to keep up, but steadily falling behind. But then I look around and I see the first buds on the Lily of the Valley, Convallaria majalis, and realize that though Spring has sprung quickly, not everything is in bloom and there will be more blooms to enjoy as the season unfolds. 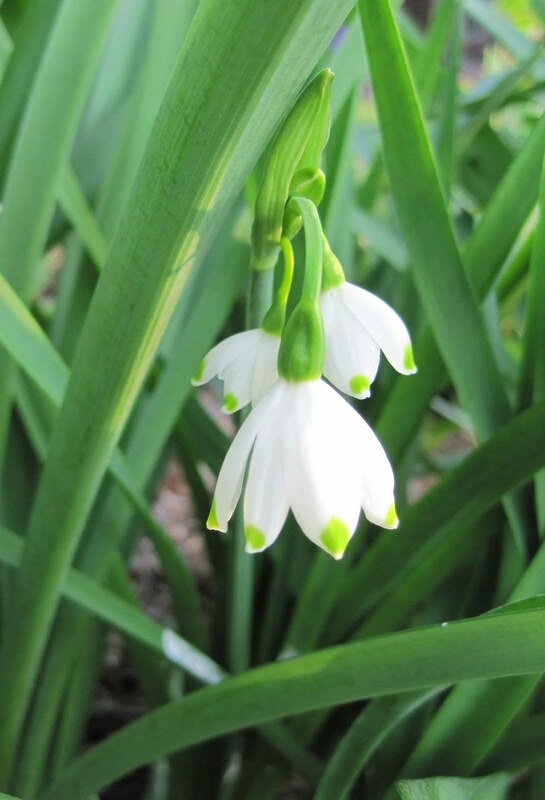 I look amid the foliage of the Surprise Lilies, Lycoris squamigera, and see the tiny, dainty blooms of Summer Snowflake, Leucojum aestivum. It isn’t the showiest bloom in the garden, shouting out “look at me” like so many other blooms in the garden right now. Nor does it lure you closer with a scent that wafts through the garden like the blooms of the lilac. It just waits to be discovered, to be admired. It slows me down, even in a garden that seems to be in a big hurry to bloom. The blossom trees in your garden are doing so much better than ours. But the rest of the garden has exploded in our first few days with sunshine. I counted fifty plants with colour. Thank you for making us keep an account of the life of our gardens. All those flowers! I bet those lilacs smell amazing -- they always do! And your bearded irises are gorgeous. Dwarf bearded iris blooming? A strange spring after an equally unusual winter. I have a Silverbell in my garden that had a lot of dieback its first few years; so much so that I though about taking it down. And then suddenly it seemed like it got used to winter in Wisconsin and now has to be pruned to keep it in bounds. So I would give your pink one a bit more time. We're later than you this spring, but I know that feeling of being behind. There is so much clean up, etc. needed this time of the year. Our few little blossoms sure brighten our days. Hehe, Lucy & Ethel in the candy factory; I just pictured you frantically stuffing dandelion puffs in your mouth! Perhaps everyone knows you're redesigning and wants to make sure you don't forget how wonderful they are! And next month it's...MAY! That's a great transformation from last month--Isn't spring great? I'm sorry to hear of your ailing halesia. It's really a standout, especially color-wise, and I'd definitely miss it if it weren't around. I hoe you're able to resuscitate it! Gorgeous flower pics! Love the irises. Happy Bloom Day Carol! It's so cool looking back at previous years' posts and seeing the differences. I hope you're able to catch your breath soon! Your spring is early and unusually hot. Ours in Austin is delayed and unusually cool (though the heat is creeping back). What a strange gardening year, no matter where you live. Spring is in a hurry in NC too. I haven't actually seen a pink Silverbell before. It's beautiful. I love your iris too. The colors are amazing. Your Irises look wonderful, ours are just forming leaves so a long way off yet. It's lovely there is so much blossom around for this bloom day. Too bad about the Silverbell, Carol - did it need a more protected location? But you sure have a lot of flowers for mid-April to console you for its not-so-hot status. The dwarf iris are too cute! My GBBD post is up and there's also a list with botanical names at Annie's Addendum. Happy April! we are behind here in Surrey, not ahead, but i'm sure we'll catch up, - the dandelion photo made me smile - my 6 yr old would have puffed that before I got a photo! In my own garden I have 45 varieties of plants in bloom today! It's all beautiful! Such lovely flowers Carol! The Halesia carolina is very pretty - I would love to have that tree in my garden! You are about 2-3 weeks ahead of us here in The Netherlands. I have mainly daffodils, Pulmonaria, Ribes and Forsythia flowering, but the first tulips and forget-me-nots are also showing. Spectacular. I'm in love with your Carolina Silverbell, Carol - that's a new one for me! I know what you mean about the warm weather- my cherry tree is in full bloom and that never happened until mid-May in the past. Kinda scary, in fact. Carol, such beautiful iris. Mine aren't blooming yet, but as you say- something to look forward to. So much is blooming this year it's hard to keep track if all of the blooms. Don't cut that tree jsut yet. It has such pretty blooms. Thanks for hosting GBBD and giving us a chance to show are blooms and see so many others. Spring here is late in arriving this year but everything is rushing apace now - hard to keep up with it :) Understand your dilemma about the Carolina Silverbell which looks a beauty. Enjoyed seeing your April garden Carol and no doubt will be exploring others later in the day. I can't believe you have Iris already, we don't have them blooming here in zone 8 yet, though they are close. I have never seen a pink Halesia, such a shame it is not doing well, maybe it will grow out of it. Thank you for hosting and happy GBBD! Your garden is way ahead of mine, spring is being slow comming. Hard to decide what to do about the Silverbells, should I trim and see how it does or just cut it all down and start again. Thank you for giving me a tour of what is blooming in your garden. Have a wonderful day. Gorgeous blooms wish I could grow them in my side of the world. There is a definite change in the season for flowering plants. They are earlier than previous years. We have had no cool winter breezes like we used to, nor did we have a spring. The heat is on and I am really not looking forward to July and August. Wow! A pink silverbell! I would try to keep it, especially after hearing Linda's experience. I'm glad I'm not the only one with a garden ahead of itself. I've got a wonderful pink corydalis to show off and an amazing hepatica for anyone who stops by. I feel like Lucy and Ethel at the candy factory pretty much all the time! Happy to see that your lilacs are blooming... that means mine can't be far behind! A dandelion that's gone to seed, it does seem eary for that even in IN. I'm always attracted to white lilacs and your 'White Angel' is very pretty. What you said about the Snowflake making us slow down in the garden is so true. I feel the same way, like everything is in full bloom at the same time, and way too early. Your Bloom Day posts are always like a preview for my garden, coming soon! I like Iris 'Smart' with its deep tones. Sorry about your Halesia. I wonder why it's struggling? Lilacs already! Those in our neighborhood are not too far behind...and far earlier than usual. We are still in Full Blown Magnolia Season here in the Chicago Area. Your Halesia blooms are beautiful, wise choice to prune back and wait and see. Gorgeous Iris plicata to open with! Happy Bloom Day! It certainly does seem like spring is in a hurry this year. Your garden is beautiful as usual. 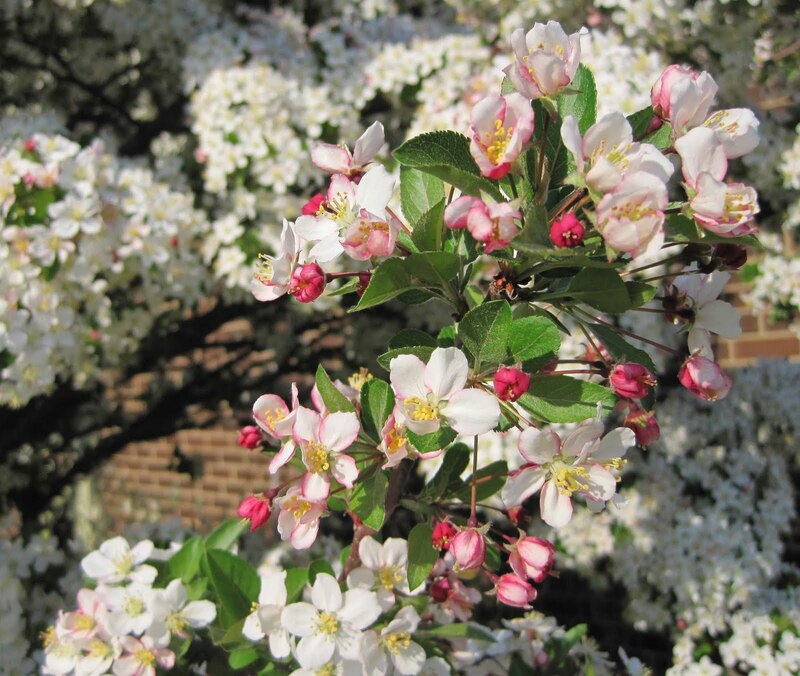 I'm thinking about addng a malus to my garden and your Guinivere looks lovely. This is my first time participating in Bloom Day! It is a joy to see all the lovely flowers here. Thank you for hosting GBBD and Happy GBBD to everyone! My post today is on hibiscus. IRISES?? Wow. Mine are sending up flower stalks, but the narcissi are still opening down here. Thanks for hosting Garden Blogger's Bloom Day. Hope to see you around The Havens sometime. As my husband and I discussed what might be blooming in your garden today, I never dreamed it would look like this. Wow! Although it is troubling to think of the WHY. Lilacs! Everyone is certainly up early with their reports. Carol, looooove the new blog design! I love your irises! Yes, even though spring weather was late getting here, some of my flowers are blooming earlier than last year. Yours are a little earlier than ours. I have an iris in bud, our dandelions haven't gone to seed yet, and the lily of the valley needs to grow another inch or so before it's ready to bloom. I'm doing a lot of rearranging of perennials, too, and giving lots away. Hi. I enjoy your blog. This is my first official participation in Bloom Day, although I have been an admirer and unofficial participant in the past. You certainly are having an early bloom day. First spring was late and now it's going crazy. It;s just the same here. I love the dwarf iris-anything that doesn't get too big is a bonus but most of all I love the blossom on your crabapples- How I miss that. Then the sweet smelling lilac. It's in my memory bank. Such a pity about your Silverbell but I would also keep it to see how it fares this year. Thanks for hosting and a very happy bloom day to you. So happy to see all of your blooms so early in the year! The lilacs and Lily of the Valley are long-lost friends of mine that I must admire through your photos since they don't grow in Florida. I feel for your dilemna regarding your cherished tree...what to do?! The garden is in a rush here in PA, too. I'm deadheading daffodils, hyacinths and tulips two weeks earlier than last year. I feel rushed to take it all in. Love the iris. I'm going out to check mine. It feels like it could have happened overnight this year. Thanks, Carol. 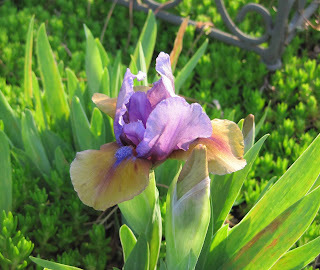 I am also surprised by irises and other flowers blooming early here. We had a hard winter. Last weekend I was in Richmond, VA, and saw roses blooming. Wow! Love that What again iris! Absolute beauty. My first iris came up the other day - two days earlier than last year! Love your pictures. Carol that phenomenon is strange almost eerie, do you think its do to our Global Warming?... love the irises and white lilac.. It feels very frantic around here too! Like everything was pent up all winter then all of a sudden rushed from the starting gates like the Kentucky Derby. Your irises have ours beat so far - the first one began opening up yesterday. The Crabapple blooms look great! HA! My first bloom day. Look at me go. I feel the same way! This is the second spring in our house and it seems like everything is growing so much faster than last year! This is my first time participating. I hope it's ok that I linked to a post that was posted two days ago about what's blooming around our neighborhood. I'm a newbie when it comes to gardening and I'm finding gardening blogs to be a great place for me to learn! Western NY has had a very unusual spring too! Blooming in my garden today are daffodils, tulips, hyacinths, leopard's bane, pansies, Grecian windflowers. Normally I would expect the daffodils and maybe pansies for this date in April. Lots to look at at this time of year. Thanks for hosting GBBD. Beautiful dwarf iris. What a shame about the halesia, but the other woodies look healthy and happy. Spring has been relatively cool in So. Calif., with even a little rain, so plants are putting on strong growth. Happy Bloom Day! Great get-together, I'm looking forward to some visiting! I sleep in and I'm number 72! This is so popular! I love your "common" lilac, Carol. Something about lilacs is universally uplifting, I think. And your dandelion flower is such a fun addition - I'm sorry to say I have too many of them already taking over my remaining lawn. Your trees look beautiful- as do your lily of the valley: one of my favorites: something for us northerners to look forward to! You really do have a lot blooming. It seems like so many gardens that were covered in snow and that were so behind ours here have now passed us by! I hope even with your garden blooming so fast that you get a chance to enjoy each one blooming. I noticed iris buds on some of mine which I thought seemed very early for us. My post is up. Not much blossom in London yet, we're a bit behind! but plenty of other things to see. Love your Iris by the way, wish I could grow them like that. I don't have much luck with them though. All your plants are looking great. It's always nice to feel like spring is early. There are almost 100 blogs already, so it seems like a lot of other folks might be thinking spring is early, too. I hope you can save the Carolina Silverbell, it's beautiful! Wow, how quickly your spring has come and the iris are lovely! Oooh... could you really remove the Carolina Silverbell? I don't even like pink, and I'm struck by the beauty of those blooms! Hi Carol! Hey, I signed up to be a part of this more than a month ago but my name's not listed. Clearly, I did something wrong. Help? My Lily of the Valley both the pibks and white are now open - pinks usually come out a week earlier. On my own GBBD post this month I posted a pic of the whites, not a great pic - need to go out and take much better pics and esp of the pinks, which everyone seems to gush over. Wish we had web smell-o-vision as it is that gorgeous fragrance that is just astounding to me. Everything in Southern Ontario is going crazy - we had very little snow this winter, so spring is off to an early start. My "star" magnolia is almost finished blooming - at least 2 weeks ahead of everything else. Tulips are just opening up, trees are all budding open, hostas are unfurling their leaves. As usual Carol, you always have an impressive garden! just beautiful! Carol - Funny that you are ahead of schedule and we are behind! But healthier because of good fall and winter rains. Your irises and lilac are beautiful, wish we could have lilacs here - they smell so wonderful. I know what you mean about being frantic in the garden. Makes me think of your GADS post - I've been ADD in the garden for the last 2 weeks with way more to do that I have time for. Oh well, lots to choose from! As Diana said, spring is a little behind down south. I can imagine how gorgeous all those trees and shrubs must be. But the fragrance has got to be the best part. I was feeling a bit frantic as well but I think that's because it was taking spring so long to get here. When it finally arrived I had to really gear up and get things moving! Finally I'm starting to slow down. It's great to see so many people linking to GBBD! Thanks, as always, for hosting it. Wow, who would have thought lilacs and snowdrops blooming at the same time? It was nice to have an excuse to take a few minutes to wander around and see just what was blooming this morning -- thanks for hosting! Carol, Your white lilac is beautiful and the lily of the valley photos are exquisite! My lilac is not quite open - methinks it needs more sun. Spring is here but it's still cool and rainy here in No. California. Oooohhhh ... I love the pink Silverbell! Don't give up on it yet. I have a white one, but the blooms are already gone - the wind blew them all off. I posted a pic of it and some things that are blooming now for GBBD. Thanks for hosting! Just added a short post from Inside Storey. We're in the middle of crazy catalog season here, but were so excited to have something to show after the winter months we had to join in! Oh dear, I'm rather late with this - stupid job takes me away from gardening! Carol, I find it interesting that this warm weather has our garden blooms converging. Usually, you're a couple of weeks ahead of my yard, but I think you're only a couple of days in the vanguard now. And I've had to keep amending my bloom list for today - two days of 80F temps have new things blooming every hour, it seems! Your iris and apple blooms are beautiful. It does seem like spring is zooming by with no time to just smell the roses...because there are so many other flowers to see and smell. I honestly can't say whether my blooms are early or not, as this is my first year in my new yard. Also, for that same reason, I need a little help identifying a few things. I'm going to have lots of surprises all year long! I love LOVE that first iris. I've gotta have it. And so glad to be here for the first time! Exciting! It's nice to feel like participating in another bloom day after so many months of deep cold! I stepped out of the kitchen garden this time around to shoot all types of flowers that grace our yard. Looking forward to browsing other bloom day posts as well! And, yes: our flowers this years are two-to-three weeks earlier than nature intended. Your yard is lovely this April. Maybe you should change the name of the blog to "April Dreams!" Such pretty spring blooms! Springs is sort of a dormant time in my yard, so I love seeing everyone else's beautiful flowers. 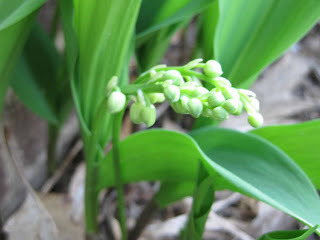 you have lily of the valley buds! wow. mine still have a way to go. thanks for hosting GBBD. it's so much fun to see everyone's blooms. New Layout, I like it! Two "Bloom Days" in a row. I must be one some sort of roll. Always great seeing what is happening with others around the world. Beautiful as always! Thanks again for getting GBBD started, it's such a bright spot in the month! It's funny - I have Leucojum aestivum blooming here in the Upper Midwest as well, but our lilacs are still at least a week away. I don't mind getting a three-week jump start on the gardening season; my cabin fever was really getting to me! I love the jumpstart on summer here in Chicagoland but sometimes I yearn for the long springs of my youth in the Pacific Northwest. It seems like the daffodils and tulips are here and gone so quickly. We are a full two weeks ahead here but my Halesia, the white, is not blooming yet. I do love that pink one. It looks quite peachy in that picture. Oh, no dandelion blooms yet either. Thanks again, Carol. You are the best hostess. Hi Carol, glad to see we're not alone in lamenting the rapid passing of the spring. I think I could find a home for that Halesia. Looks pretty enough to me. I find the Leucojum are kind of like a return visit of the snowdrops. It's like this time they are here to make a serious statement. A bunch of them is really nice! I do love irises! I have one bud and am hoping for more. 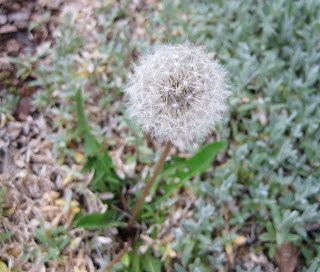 Oh, three cheers for the dandelion photo, totally. If I thought I could get away with it without being lynched by the lawn-loving neighbors, I'd grow them on purpose. May I make a suggestion? I would love it if folks would post where they are in the world with their links, because I'm always hunting for garden bloggers in my neck of the woods. I added my link this month as Lisa's Garden (Texas) to maybe start the ball rolling. Thanks, as always, for hosting Bloom Day! My first GBBD - thanks for the opportunity! Hi, thank you Carol, for clearing up my confusion. Especially on a day when you're so busy. You should be really proud of what you started here - it's a really fun post for everyone. Thank you again! Finally have my post up. This month has been much better for flowers than last month in my garden. My summer snowflakes are finished, but I love that little flower and enjoy seeing yours. I'll have to take a pic tomorrow and post it. I just found out about this! :) Lovely idea. For April, my Bloom Day was a real bore this year. I blame the weather. Well, I finally find the source of this Bloom Day thing. I've posted the Bloom Day on my blog in the past, but never before left the link here. Now I can find all the other Bloomers in one spot! Oh Lordy, Miss Carol you need to do somethin bout this weather. I'm scared. I have pink things now. It is too early for pink. Hello! I'm fairly new to gardening and to the blogger world, and I'm excited to be part of the online gardening community. Carol, GBBD is a great idea! I can't wait to read through the rest of your posts and to see what everyone else is growing too. I echo your sentiments. Spring in Tennessee seems to have been on fast forward the past few weeks. We've tied record highs in the upper 80s this week. Oh well, the flowers seem to like it. We could use some rain though. Thanks for hosting. This is my first year to do the GBBD and I look forward to the 15th because of it. Well its still April but those lovely blooms show me why you "dream of may"
After months of enjoying everyone else's GBBD posts, I'm finally with the show!! Here in Seattle, things are starting to pop up! Combine that with light until 8 pm, it's wonderful!! Thanks for hosting Carol. Love the dandelion. Or blow flower as I thought it was called well into my twenties. Wow this has gotten so big! So many great posts! (Enough exclamation marks, sorry about that.) Anyway, the wildflowers have been great this year with our cooler and wetter than usual spring. The biggest problem was deciding what to post. Happy Spring and Happy Tax Day. Our spring has been unusual too. The cold weather delayed some plants so it feels like everything is blooming at the same time. Lovely flowers. Nice after a hard winter, isn't it? I vote for keeping the tree but prune the dead, douse the ground with Superthrive, compost & mulch. If it doesn't thank you by fall, replace. I really thought I'd make it before midnight this Bloom Day, Carol, but it seems I talk too much. Your garden is really belting out the blooms! Those pasel irises are magnificent. I'm just as confused as you when trying to decide which chore should come first. If only spring would slow down just a little and give us more time to enjoy all the wonderful sights and scents. I enjoyed this.. I'm sure I'l be back! I'm already missing that heady Spring feeling that your garden seems to be in the throws of right now. I can feel Summer around the corner. Time to plant some veggies! How unfair to have to decide what to get rid of when things are so lovely! In a rush today - even so I DID notice the dandylion "clock" !! I thoroughly enjoyed reading your post and looking at all that you have going on in your gardens. I'm too late to join in this month, but hope to catch up next time. I'm a day late, but I got here! This is when the GBBDs starting getting so fun. Just think about what the next few months are going to bring! I've been watching your weather tweets with amazement. Sometimes you're hotter than down here in Austin. The way you describe the onslaught of spring is how we usually feel. Nothing. Nothing. Nothing. Explosion. Nothing Nothing. This year has been so cool and wet that our spring is lingering in a lovely fashion. The world seems turned upside down. Wow, I thought we were way ahead but we're nowhere near irises yet. I don't think... I'll have to look again tomorrow. I'm late to the party as usual, but thanks as always for hosting! Thanks so much Carol! I almost didn't make it to the party, but who could resist? Love your Iris! Happy bloom day! I have some spring blooms to add to GBBD this month, even though the post is a few days late. Better late than never. I seem to have missed the day, but thought I'd participate anyway! That malus of yours is looking absolutely fabulous! My, Carol your garden is wonderfully Spring like... and its ahead too! We are a bit behind this year but that's okay as I've a pond to dig and plants are getting moved around. how gorgeous...so many flowers already...our magnolias just came out, and tulips, and a few i don't know the names of. What a great idea and fabulous way to connect with other blogger-gardeners! A strange spring everywhere, it seems. 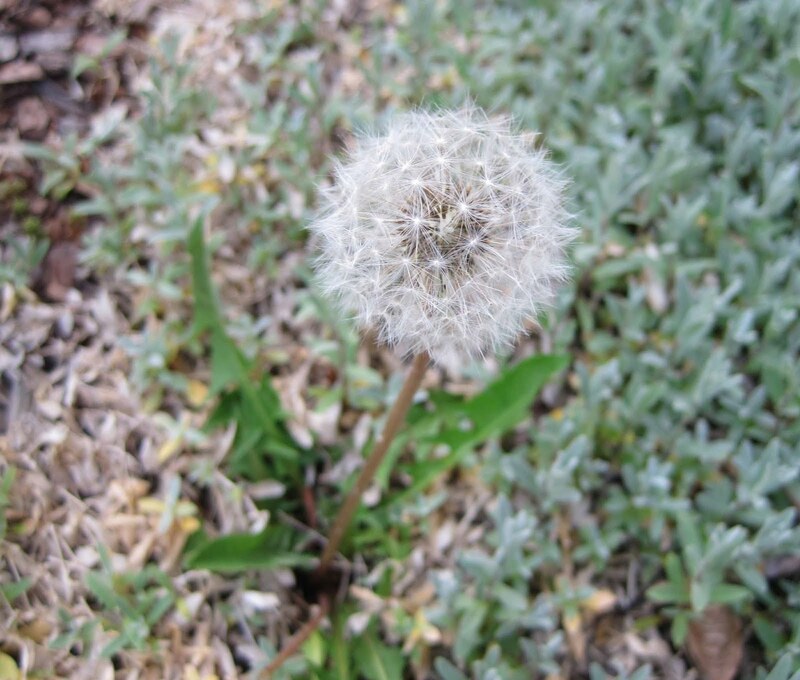 Even the dandelions are in a hurry to set seed in case it's their last chance. Love your irises. Must put some on my wish list. Your summer snowflake is beautiful, looking rather demure and shy. I just found this blog and I love the idea of posting what flowers are blooming on the 15th of each month!! 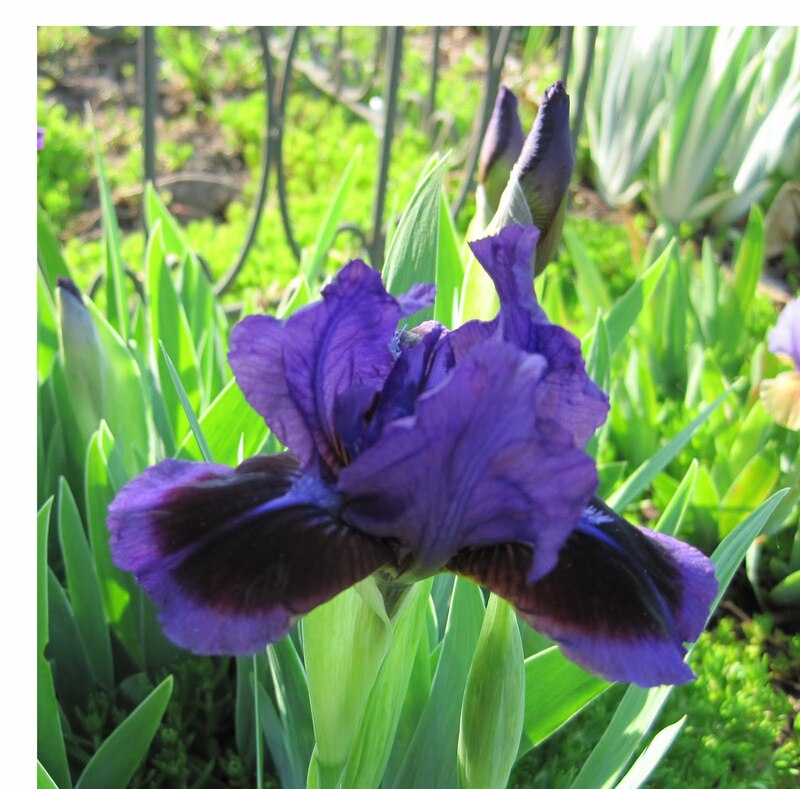 Tomorrow (May 15th) I will be posting pics of irises, my gorgeous rhododendron, geraniums, begonias, spirea...maybe some others also..this is a great idea!! Excited to participate in my first Garden Bloggers Bloom Day. Got too hectic to enter the names, but the photos speak 1000 words, right? I promise to post with plant names and pics next month! Irresistable Irises and Lovely Lilacs at your place. Thank you for hosting GBBD once again. Mr. Linky seems to be busy right now after more than 200 entries. I'll try again later. Meantime, clicking my name leads to my Bloom Day post.